Direct flights are with Avianca, the Columbian national carrier and leave Heathrow at 10.00 p.m. Five hours behind and you arrive somewhat bedraggled at 4.00 a.m. into Bogota. The pre-arranged transfer doesn’t show up but a smartly dressed local seems to know what’s going on, makes calls and we share with some fellow riders and arrive at the hotel intact. Columbians rise early. The roads are furiously busy even in the morning light. It is every man for himself as each car hurtles along, aiming for that extra edge, weaving across lanes, horns blaring and mercifully missing everyone else. A small, simple hotel on a quiet residential street the Casona is pleasingly traditional and with decent wi-fi. As I soon realise, it’s in keeping with Bogota in general – every architectural style and period is just thrown together and left to fight it out. We decide to stay up for breakfast. It starts at 6.30 so eggs on cornbread and hot chocolate before bed and a few hours of decent sleep. Bogota is expanding fast with 15 million souls crammed into insufficient space. The circling mountains seem very close behind every high rise block and the newest and ugliest are climbing up into the hillsides. A bit far out to walk , we take a taxi. This ride was pretty sensational. We experienced the 24 hour rush hour, a crazy pell-mell of dashing people. Then the rains came, heavy at first and then tumultuous. Streets became rivers in full flow, water burst out from the drains but the traffic thundered on. Some motor bikes took shelter but no one else seemed to give an inch. Pedestrians not drenched by the rain are soaked by the tidal waves created by trucks. I can only imagine the vast quantities of water flash flooding down from the mountains and picking up speed on the city streets. Through the spray, steam and downpour we swept up and downhill, sweeping past huge parks, glimpses of the sky scrapers stretching into the distance and some folk just walking along, brollies in hand having a chat. A genuinely spectacular introduction to the city. Our man got us almost to where we wanted to be and thankfully the worst had passed. Throughout the day it is clear that Bogota has an issue with rubbish, now most of it was floating downhill and smeared across every road. Cancelling thoughts of a cultural walk we headed indoors. 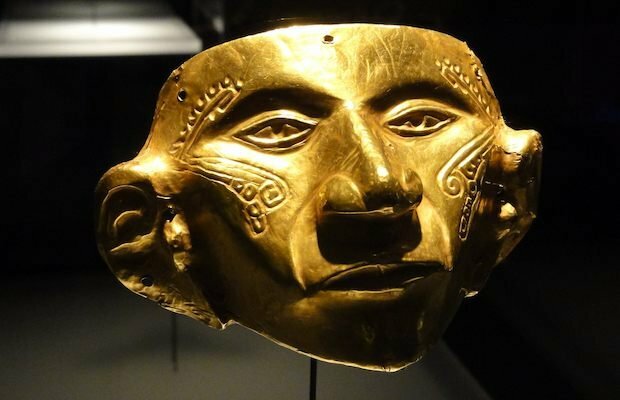 The Museo del Oro is a sanctuary of extraordinary beauty. Whatever the carnage outside, the Museum of Gold struck me as a masterpiece. Dedicated to a singular skill, the creation of beautiful objects from precious metals, especially gold, the museum reveals extraordinarily beautiful objects, crafted and detailed with perfection whilst telling the story of their maker’s beliefs and lives with great simplicity, beautifully displayed and crowned by information in immaculate English. If it’s possible to zoom in on these two items then it might give some impression of the delicacy and artistry. There are thousands of examples in this marvellous place. Entry is a princely £1.00 or free if over 60. Sadly we were not required to provide evidence of age. This remarkable raft with a sun king / queen in the middle surrounded by priestly figures throwing carefully crafted gold symbolic pieces into a lake is only about 8 inches long and is so intricate that photos do no justice. 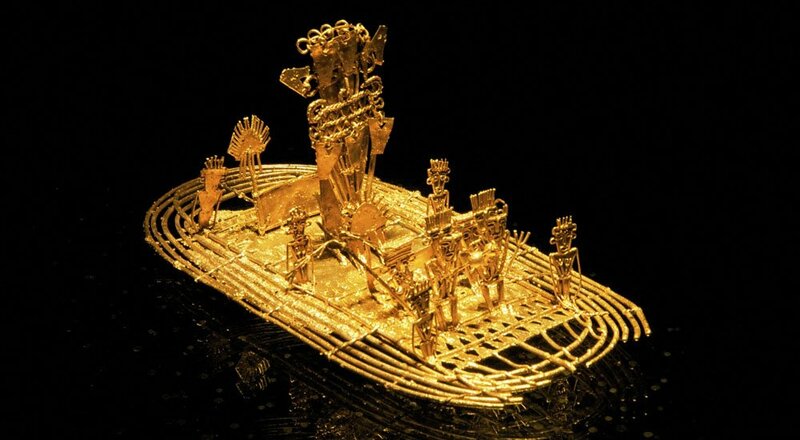 A Spaniard observed such a ceremony in the 1500s and believed that they were the source of the El Dorado myth and fuelled the conquistadors lust for gold. To the indigenous folk the gold apparently represented the sun and creation whilst the lakes were mother earth and the ceremony kept the world in harmony. Sunset is just after 6.00 and with the darkness Bogota seemed to become an even more fervent place. I’m not a city dweller but the incessant bustle, hordes of people, crammed buses (three stage bendy buses), belligerent car horns, mounds of rubbish, homeless and destitute folk topped with my inability to comprehend anything happening around me, certainly did not endear me to the place. It felt safe enough but we still caught a taxi out to the suburbs. I have no idea how old Bogota is – there are many colonial European buildings, churches, squares and monuments jostling for light with opulent state of the art blocks, sitting next to the most ramshackle and run down developments; every brutal ugly and best forgotten style is well represented; the finest of shops sitting next to the poorest folk selling cigarettes and sweets. Everything and body seems to be fighting for space amidst broken pavements and roads seething with people. 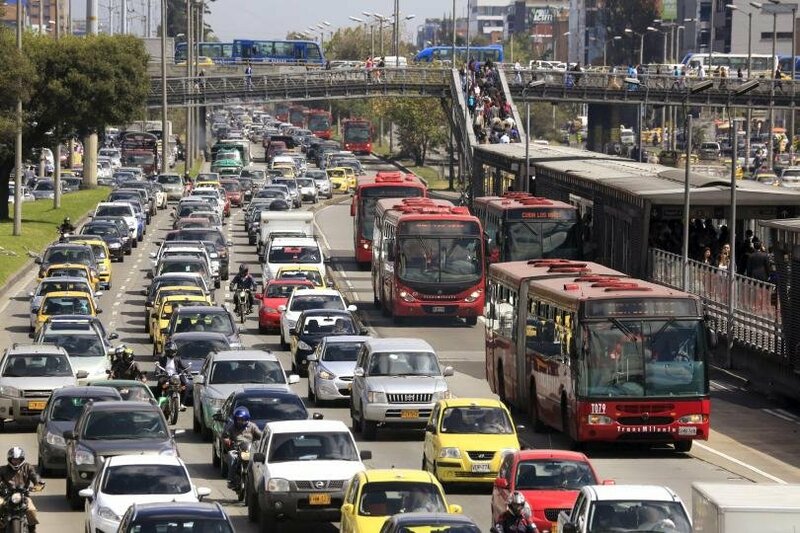 Somewhat remarkably somewhere in all of this mayhem Bogota has one of the world’s longest dedicated system of bus lanes, 350 km of cycle lanes and each Sunday closes 60 km of roads to cars, freeing them up exclusively for cyclists.